- in a profoundly entertaining show. The show features Ricci singing the classic hits of his father as he celebrates his life like you've never seen before. Reviews of the show and audience response have been tremendous! “It’s loaded with music, personal photos and true life stories not only about Dean Martin, the international Entertainer, but also Dean Martin, the Father” - and they are told from the heart by none other than his son, Ricci. The idea of the show? Credit the talent of the versatile singer, songwriter, musician, and producer, Ricci Martin. 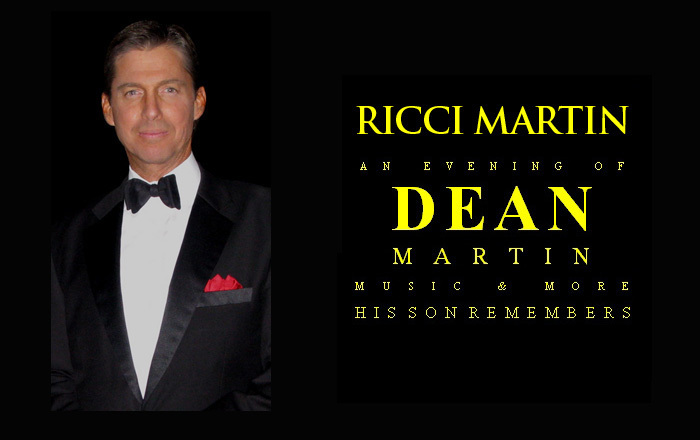 “Ricci's vocals truly make each of Dean's classic hits come alive!” Then there's the WIT and humor; ”Ricci's one-on-one interaction with the audience always brings laughter and other surprises. The show features Ricci singing the classic hits of his father as he celebrates his life like you've never seen before. Ricci's band includes veteran world-class musicians and singers, Robert Zarate (keyboard, vocals), Jimi Seville (piano, vocals), Jerry Vilicich (bass, vocals) and Ron Robertson (drums, vocals). Catch a show and enjoy the fun! Copyright (c) 2013 Ricci Martin. All rights reserved.